With a background like this, we out-truck all competition. Southport Trucking was inspired on the back deck of the best raw bar in Fort Lauderdale. That was in 2004. By 2008, the dream was made official with the company’s first truck. Founded at the onset of the financial recession and battling a surplus of truckers and record high fuel prices, Southport relied on a lean fleet and a superior trucking experience in order to establish itself. Word traveled of the West Michigan company with reliable trucks, loyal crews and steady growth, setting Southport Trucking apart as a community of drivers with a strong sense of ourselves, building a presence around the nation. Policies, routes, delivery dates—we run a business that’s efficient, and we don’t create any kind of run around for our clients or drivers. From our clients with well-protected and timely cargo. From our employees with fair pay, mileage and vacations. We know what’s most important. So we work hard to ensure every driver is home every week, and we support married driving teams. We’re talking about our clients, our employees and our trucks. Keeping the fleet up to date, practicing financial discretion and recognizing hard work. With a presence throughout the country, Southport Trucking specializes in running freight lanes throughout Washington, Florida, California and Arizona. Our Thermo King Refrigeration Units make us the ideal transport option for food and perishables. However, our full truckload and LTL services also equip us for transporting any kind of freight. We maintain 100% on-time performance and offer extended cargo insurance and tracking options. Based in Holland, MI, we’re unashamed snowbirds, eager to carry freight in the sunshine and warmth as often as we can. 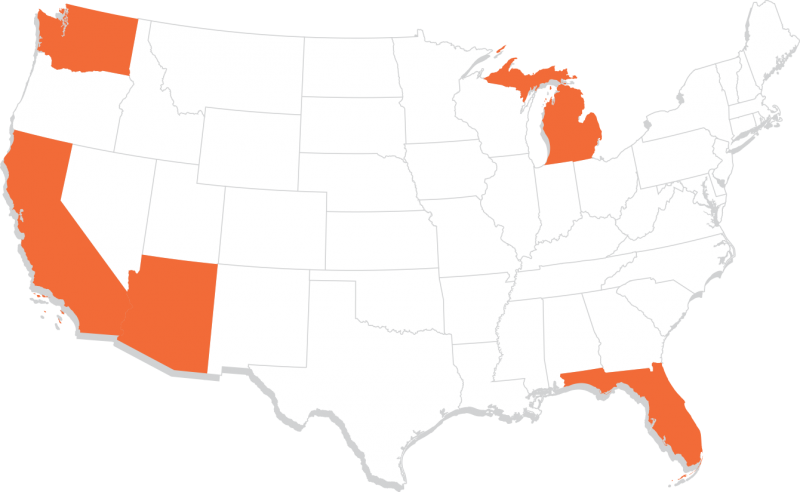 With our hub in West Michigan, we travel routes throughout the Southeast, Southwest and Northwest.